Drywall is relatively strong and able to withstand a fair amount of force; however, hitting it with the edge of a table, box, tool, or any other heavy object may damage it, leaving behind a small yet visible hole. 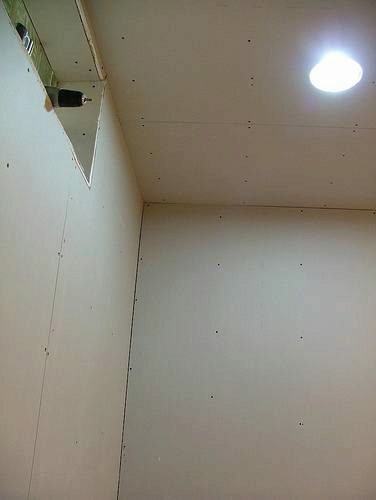 The good news is that you can typically repair small holes such as this without replacing the entire sheet of drywall. All it takes is a little bit of work and some basic supplies. For a step-by-step walkthrough on how to patch a small drywall hole, keep reading. Most national home improvement stores sell kits designed specifically for drywall repair. These kits contain a drywall compound along with a heavy-duty patch. Although application varies depending on the particular type of drywall patch kit, homeowners are typically required to fill the hole with the included compound, followed by smoothing it out with a putty knife or scraper. The drywall compound must be flush with the wall in order to create a smooth fill. If it protrudes out or slumps inwards, the patch won’t settle right. With the compound packed into the hole, the patch is them applied on top. This is necessary to prevent further damage to the newly patched drywall hole, and it offers a clean area to paint (if you wish to paint over it). Of course, you can always patch small drywall holes yourself without purchasing a kit. First and foremost, however, you’ll need to create a suitable patching area by cutting away some of the jagged drywall on the sides of the hole. Use a utility knife to cut a square or rectangle around the hole. This will naturally make the hole larger, but it also makes it easier to patch. Once you’ve cut around the hole, dig down inside to clean out any drywall material or debris. With the drywall hole prepped and ready to go, use a putty knife to apply spackling compound. Be generous with your spackling but don’t overflow the drywall hole to the point where it’s protruding out (remember, you want it flush with thew wall). Go ahead and smooth it out with the putty knife, removing any excess spackling. After the spackling compound has finished drying, use medium-grit sandpaper to smooth the surface down. You can then paint over the newly patched drywall hole with the same color paint as the surrounding walls.